Dutchland Plastics LLC (Oostburg, WI), a contract manufacturer of custom rotationally molded (rotomolded) plastics products, is celebrating its 50th anniversary by giving back. It has announced a major new compensation, benefits and growth plan affecting all existing and prospective employees. Dutchland PlasticsThe growth plan includes adding 50 positions to the manufacturing team, raising starting pay and hourly wages, increasing the number of paid holidays and conducting a full review of all benefit plans.The company also will continue to enhance its family-friendly activity programs. 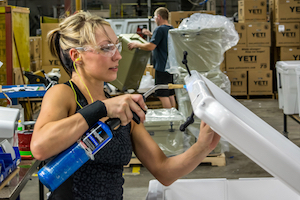 Dutchland, which manufactures Yeti coolers, NuCanoe boats and KI chairs, is the third largest contract rotational molder in the United States. Manufacturing is conducted in two modern rotomolding facilities, totaling approximately 200,000 square feet; an entire suite of value-added services are offered, including forming, drilling, finishing, assembly, inspection, warehousing and logistics. The company’s manufacturing is highly differentiated with the capability to mold small, medium and large size parts with complex geometries and tight tolerances, using a broad range of raw materials. Revenue has more than doubled over the last three years and is poised to double again in the next three years, according to Dutchland.